Inspiring Ideas with artist Jeanne Winters: Art Studio Taking Shape! I've been receiving lots of emails asking about my art studio project. If you're new, please see some of my previous posts about this undertaking. Today I will reveal one little corner: (This is by an outside door that's never used.) We decided to move our existing office in here, too, so the now studio/office is taking a bit longer to get organized... And I have to design hubby a guy corner for his desk. Our new space is getting tremendous use, and WE LOVE IT!! !, but I can't bear to show you the rest of the space just yet! Notice my bins/buckets? ... they were on clearance this summer at my local Targé in exactly the colors I wanted! I snapped up as many as I could fit in my cart and came back for seconds another day! They work perfect with my black metal utility shelves that were already in the room to begin with. 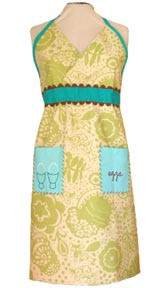 I'm LOVIN' that apron BTW! 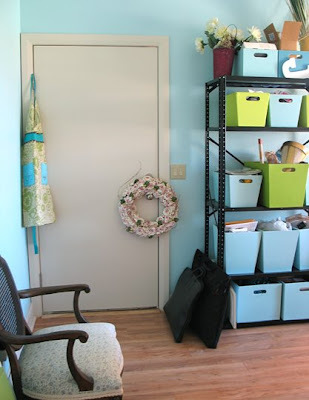 Love those storage bin colors ~ Aqua and lime green.